Here’s a tip for election night, from my left brain to yours: There’s a better chance than you think that the elections, and the market reaction, won’t go the way you expect. If you’re like me, you’ve been thinking about the US midterm elections for months...at least. 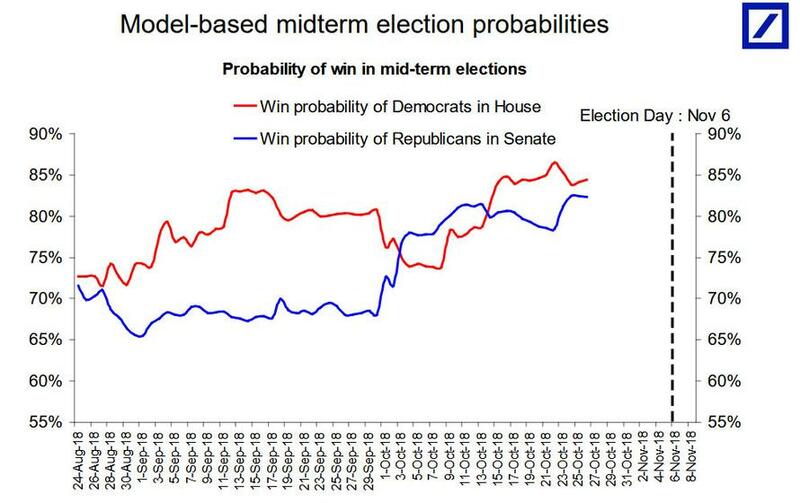 And if you’re like me, you’ve noticed that polls, betting markets, and model-based probabilities have been stable in pointing to a single outcome as most likely: Democrats take the House, Republicans keep the Senate. And if you’re like me, you’ve probably translated that stability into overconfidence that this will be the outcome. So let’s engage our left brains for a minute and think this through, with the help of some statistics. I’m not arguing that the polls could be wrong. Rather, I’m reminding you that polls have a margin of error. Keeping that in mind, you’re less likely to think the 2016 polls were ‘wrong’. After all, Hillary Clinton won the popular vote by 2%, less than expected but well within the margin of error. Furthermore, the error does not have partisan bias – while Trump outperformed polls in key states in 2016, remember that in 2012 Obama outperformed the polls. The point is, when polls indicate relatively close races, of which there are many in this Congressional cycle, uncertainty is high. For that reason and many more that we’ve discussed, we think the poll-based models, rather than polls alone, do a good job of assigning probabilities to different outcomes. Sadly, we humans don’t do as good a job of interpreting them. This brings us to the problem for investors. The most likely outcome – Democrat House, Republican Senate – has been carrying a probability of about 60-65% and results in legislative gridlock, hence status quo on policies that influence markets (fiscal stimulus, regulation, and trade). The results that take these policies in meaningfully different directions make up the other 35-40% – with meaningful chances that either Republicans hold both houses or that Democrats sweep. Said differently, there’s a significant chance that voters choose an outcome that shifts US policy from the status quo. Trade risk is a constant. On election night, focus on other variables. While much is made of election outcomes influencing markets by shifting trade policy, we think this is overstated. Even if Democrats take control, they have their fair share of trade hawks. Hence we see trade enduring as a risk market pressure regardless, and for election night would focus our attention on how other variables are influenced. Fiscal outcomes influence today’s key market variable (rates), driving volatility. Our equity team sees margin pressure from rising costs (namely wages, trade, and interest) as key to stocks. Here, election outcomes could drive very different perceptions, at least in the near term, of the direction of cost pressures by influencing the direction of interest rates. If Republicans hold both houses, the main expected effect is more fiscal stimulus through tax cut extensions. That could drive expectations of higher rates and a more hawkish Fed, applying near-term pressure to stocks. If Democrats sweep, they won’t be able to change fiscal policy before 2020, but it would change expectations of the trajectory beyond it. Winning Senate control means Democrats would have won more than 11 seats in states that voted Republican just two years ago despite polling deficits in some of those areas. That would imply Americans are more supportive of progressive policy than many believe. All of a sudden, it’s reasonable to think about fiscal contraction (i.e., rolling back some tax cuts), albeit after 2020. This shifts the narrative away from rising rates and, in the near term, alleviates the pressure stocks have felt in recent weeks from risks of higher input costs. Consider alternative hedges. Given the case above for volatility, our cross-asset strategists have ideas for you heading into election night. Being long equity vol makes sense, but even more so they like going long DM FX volatility to reflect idiosyncratic political risk of various stripes. Stay cautious in corporate credit. As a relative outperformer, the market hasn’t onboarded many of the nonpolicy concerns that have been key this year’s ‘rolling bear market’ across asset classes. Hence, even if election night drives a constructive near-term narrative for credit, perhaps on tax policy, we would use any rally to continue moving up in quality. Maybe this wouldn’t be your playbook, but in any case we want you to embrace the uncertainty rather than plan for the expected.